2Acıbadem Üniversitesi, Beslenme ve Diyetetik Bölümü, İstanbul, Türkiye Objective: The aim of this work was to determine the relationship between the anthropometric measurements used in the definition of obesity and biochemical markers which is related to risk of chronic diseases such as type 2 DM and cardiovascular disease. 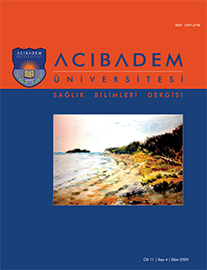 Materials and Methods: This study was carried out on 180 participants aged 18-85 years (146 women, 34 men) and applied between 02 January 2014 and 31 December 2014 at Başkent Ankara Hospital Ümitköy Diet Polyclinic. The participants biochemical and anthropometric data were evaluated. Results: The mean BMI of study group was 28.8±5.25 kg/m2 and waist to height ratio of study group was 0.53±0.10. 39.7% of the women and 50% of the men were in the risk group for waist circumference values. The frequency of waist to hip ratio in the risk group was 85.3% in women, whereas this frequency was 67.6% in men. There was a positive and significant correlation between BMI, waist circumference, waist to height ratio, waist to hip ratio and fasting blood glucose, HbA1c, LDL cholesterol and TG (p<0.05). There was a negative significant correlation between BMI, waist circumference, waist to height ratio, waist to hip ratio and HDL cholesterol. There was a positive and significant correlation between BMI, waist circumference, waist to height ratio, waist to hip ratio, body fat percentage and diagnosis of insulin resistance (p<0.05). There was a positive and significant correlation waist to hip ratio and diagnosis of DM, hypertension (p<0.05).